Arietta, an ultra-premium Napa winery specializing in limited production Bordeaux-style blends, is owned by wine specialist and auctioneer Fritz Hatton and his wife Caren. One of America’s most celebrated winemakers, Andy Erickson, crafts the Arietta wines from carefully chosen blocks in the cooler climates of Napa Valley. The Arietta wine portfolio currently consists of five red wines—H Block Hudson, Variation One, Merlot, Cabernet Sauvignon, and Quartet—and one white wine, On The White Keys. The Hatton’s founded Arietta in 1996 in partnership with winemaker John Kongsgaard and his wife Maggy. The partnership was born of a shared passion for fine wine and classical music. The vinous inspiration for Arietta was an extraordinary 2.3 acre block of Cabernet Franc on the Hudson Ranch in Napa/Carneros. The fruit from this block of Cabernet Franc serves as the core of the Arietta Red Wine H Block Hudson Vineyards. 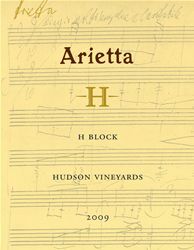 The Arietta project grew with the selection of additional superb blocks of Merlot and Syrah on the Hudson Ranch, which made possible the addition of two wines to the Arietta portfolio: Arietta Red Wine Variation One, an innovative blend of Merlot and Syrah, and Arietta Merlot Hudson Vineyards. Pursuing our principle of purchasing fruit only from the very finest vineyard blocks, Arietta in the 2003 vintage purchased a small quantity of Cabernet Sauvignon from Howell Mountain vineyards farmed by famed Napa grower David Abreu. This fruit afforded us the opportunity to release a small quantity of Arietta Cabernet Sauvignon in the 2003 through 2005 vintages, as well as the Arietta Claret 2004 and 2005. In 2006 Arietta leased a fabulously situated 1.6 acre block of clone 337 Cabernet Sauvignon in Coombsville, which became the new core of the Arietta Cabernet. The same year saw the introduction of Arietta Quartet, a blend four Bordeaux varietals. Since 2009 the core of the quartet has been a jewel of a three acre vineyard in Coombsville, painstakingly laid out and planted by famed viticulturist David Abreu in 2003. In 2005 Fritz Hatton and his wife Caren purchased the Kongsgaard’s interest in Arietta and invited Andy Erickson to become Arietta’s new winemaker. Erickson crafted Arietta’s first ever white wine, Arietta “On The White Keys” 2005, from very rare hillside blocks of Sauvignon Blanc on Sonoma Mountain and two tiny old vine Semillon blocks in the Hyde Vineyards in Napa Carneros. Barrel fermented and aged for eight months in a combination of stainless steel, new oak, and French oak barrels, the Arietta White Keys, with its distinctive combination of vibrant flavors and a grand finish, was an instant success upon release in the fall of 2006. Arietta's label features the manuscript of Beethoven's Arietta movement from his last Piano Sonata, Opus 111, written long after the composer had lost his hearing. Opus 111 is one of the most transporting and revolutionary pieces of music ever composed. Serene yet complex, rich yet ethereal, Beethoven’s Arietta provides an inspirational model for great winemaking. Tasting is in the Arietta cave spur at Chateau Boswell. To join the wine club, visit www.ariettawine.com or call 707-963-5918. Mailing list only. Subscribe on-line at www.ariettawine.com.